This press release is a statement from the International Diabetes Federation, related to studies published in Diabetologia and was not written by Body1. 29 June 2009 - The International Diabetes Federation (IDF) today called for urgent assessment and responses from regulatory authorities into a possible link between the use of insulin glargine (an insulin analogue) and increased risk of cancer based on findings published on 26 June, 2009 in Diabetologia, the journal of the European Association for the Study of Diabetes (EASD). The online data published in Diabetologia is based on four studies relating to a possible link between a long-acting insulin analogue, insulin glargine and cancer. According to EASD, the findings are based on evidence from studies in Germany, Sweden, Scotland and the United Kingdom. The studies however, are not conclusive. The International Diabetes Federation understands the concern about the Diabetologia study findings but urges the diabetes community to wait for the current scientific information to be released and calls for urgent further scientific studies to be undertaken in other countries. The International Diabetes Federation stresses that it is important that people needing insulin do not stop taking the drug. IDF cautioned that people with diabetes should see their doctor for advice before considering any change to their treatment. _further_investigation#63329) - and give us your thoughts. 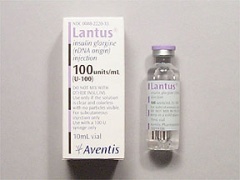 I know for myself, that next time I see my endo - I will be requesting that I change from Lantus to Levemir instead. I feel safer in doing this then using Lantus.